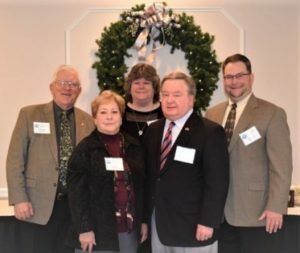 Read about our 2018 Champions of the Community. Was developed in 2000 by the Foundation Board of Directors to recognize those who serve others in a way that contributes to the overall health of the community. The focus of the program is to: Honor adults and youth who voluntarily give their time, talent and resources with no expectation of personal gain; Recognize adults and youth who provide leadership in their neighborhood or ethnic community; Honor adults and youth who support those less fortunate or those facing insurmountable circumstances. Some individuals are overlooked because they are not widely known or associated with a well-established organization. 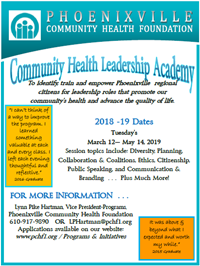 The Phoenixville Community Health Foundation honors the hard work, special achievements, and good deeds of the unsung heroes of the greater Phoenixville community. The nomination procedure includes: Completed Nomination Form and a nomination narrative of no more than two pages. Nomination deadlines are announced annually. Champion’s nominations are accepted from the community … organizations as well as individuals may submit nominations. An independent Selection Committee is assembled and, reviews all nominations and chooses up to four (4) Champions of the Community annually. Each Champion is honored with a $2,000 grant being made in their name to the charity of their choice. A list of prior award winners is available.